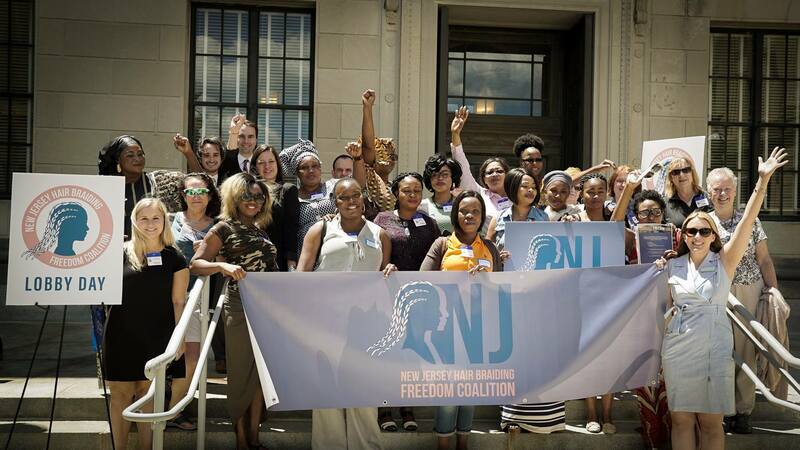 Led by African-style hair braiders from all across the state of New Jersey, the New Jersey Hair Braiding Freedom Coalition is advocating for the “Liberty and Prosperity” that is promised to New Jerseyans. As it stands today, New Jersey has made it illegal for African-style hair braiders to earn an honest living from braiding hair, unless they first spend thousands of dollars and attend 1200 hours of government mandated cosmetology training. Even worse, the training barely touches on braiding. Instead, the great majority of the class hours are spent on the use of chemicals, dyes and methods of treating Caucasian-type hair over tightly coiled Afro-textured hair. This license requirement prevents liberty and prosperity. African-style hair braiders do not need a license to braid hair! Hair braiding is typically classified as “natural hair care” because it involves no cutting, dyeing, application of heat or use of caustic chemicals. Braiders style Afro-textured hair naturally, through the artistic and individualized craft of twisting, braiding, weaving and locking hair. The act of braiding is safe for braiders to perform and safe for the people getting their hair braided. It is deeply rooted in African cultural heritage and carries with it significant historical importance. Please help us in our pursuit of Liberty and Prosperity. African-style hair braiding is a safe, time-tested and natural craft that can provide a path to entrepreneurship and self-sufficiency for so many if New Jersey would simply remove the burdensome license barrier.